Kind heart, warm soul, and an irrevocable groove. Anais Pierquet is an absolute killer on the longboard; her sure-footed finesse and easy rhythm on the water is not one to be missed as she dances along the waves of Batu Balong beach. 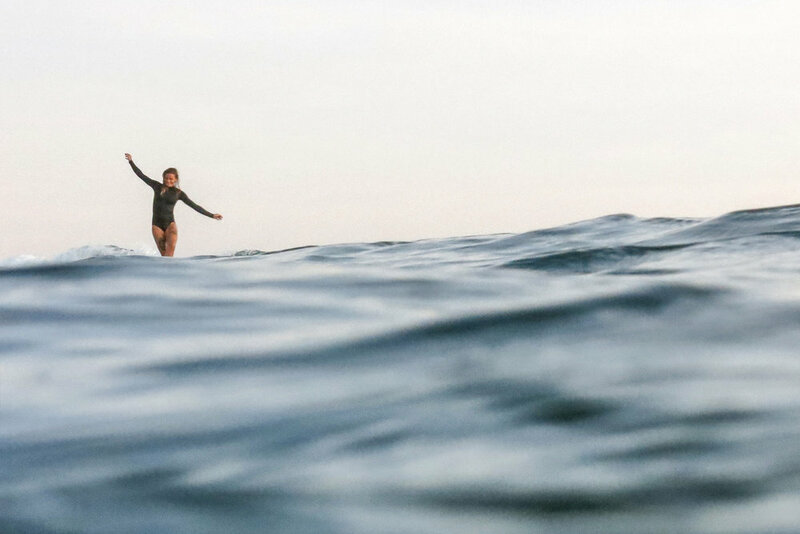 Based in the creative hub of Canggu Bali, Anna has committed herself to a life of leisure and endless adventures through her brand Blank Pages, and general love of life. There's no doubt you're one of the grooviest lady sliders out at Old Man's break. What are your first memories of longboarding, and what drew you to the surf culture? Haha you're funny! Damn I don’t really remember when I started long boarding! When I first started to surf I learnt on a short board, but after a while I guess I got bored at some point aha. I needed a more chilled out, mellow and funky surf sesh, a way to express myself. When I was a kid my dad was always windsurfing or wake boarding, he was addicted to water sports and I guess it’s been passed down to me too! Since so young I was dreaming of Hawaiian flowers, ocean breaks and surf even when I had no concept of what it actually was. You moved to Bali almost a year and a half ago now. Why did you decide to base yourself in Canggu? Yes! Two years now actually. I came to Bali with my best friend & started surfing and just immersing myself in the laid back lifestyle- after that I never wanted to leave haha! Canggu has a good vibe even if now that it’s getting more and more crowded. Waves are fun most of the time. Really it’s just the first stop on a life of adventure; I hope that the next will be Hawaii! Your brand Blank Pages, and its admirable ethos, is the epitome of the way you live your life. What inspired you to create such beautiful handmade products? I guess it all comes from travelling! We all need to see the world and to see the world you need a bag, at least a small one to put your best camera in. I am also massively inspired by nature- mainly the gorgeous colours of flowers and plants, and colours of the sky. Nature is the most creative thing on earth- epically beautiful! How would you compare the break back home in France to Canggu? Well believe it or not I’ve actually never long boarded in France, only hopped on the short board! It’s a shame, but I will definitely be back to change this soon! I heard there’s a great left in South West of France that I would love to sink my teeth into! What does being creative mean to you? And how does surfing revolve around this? Being creative for me is self-expression, it’s the only way out. Plus creativity is not limited to one form- you can do anything that you want, everyone has their own way of expressing their creativity. Like you throw yourself into photography, I paint or write poems. For me this is how I can heal all pain, express all joy, and open my heart to let go of it all! Favourite tattoo of yours, and the artist behind it? Ooo that’s a tough one. I have so many! I have to say that my back piece made by one of my best friends Clea is the one that I cherish the most. A beautiful bunch of flowers to celebrate life!